Thermography is an imaging technique which maps body surface temperature changes that could suggest inflammatory, circulatory or neurological abnormalities. It is increasingly being used to investigate lameness and may be useful in the diagnosis of laminitis. However, a controlled environment and strict protocol are required to accurately interpret images. This review suggests that thermography is a useful complementary diagnostic tool in veterinary medicine, helping to find areas of abnormality and guide further diagnostic imaging or treatment, and is useful for monitoring response to treatment where inflammation is involved. However it suggests that using thermography to evaluate surface thermal patterns requires "a controlled environment and rigorous adherence to an imaging protocol to eliminate errors of interpretation", and that the specificity and sensitivity of thermography may be limited. "Thermography has been shown to be a practical aid in the clinical evaluation of lameness. This modality specifically increases the accuracy of diagnosis. Thermography represents skin temperature, usually pictorially." "Noncontacting thermography, which detects infrared radiation, is the most accurate. In order to be accurate, thermography must be performed in a temperature-controlled, draft-free area. The area should be protected from sunlight to avoid erroneous heating of the skin, and the hair length should be uniform. Thermography detects heat before it is perceptible during routine physical examination; therefore, it is useful for early detection of laminitis, stress fractures, and tendinitis. It offers a noninvasive means of evaluating the blood supply to an injured part and offers one of the only reliable means to evaluate blood flow to the foot of horses with navicular syndrome." "Thermography is an excellent adjunct to clinical and radiographic examination. It is complementary to other imaging techniques such as ultrasonography and scintigraphy." The “ODD COUPLE” …The Professor and the Thermographer - Malcolm West - Thermal Inspection Services Pty. Ltd.
Thermography helped to diagnose that front feet affected by repeated laminitis had a lower temperature than the hind feet. Hoof temperatures of 30 degrees C for more than 24 hours during the developmental stage of carbohydrate overload laminitis can indicate impending laminitis. ​See also Hoof wall surface temperature. Secretion of thyroid hormones is regulated by the hypothalamus through a negative feedback loop. When blood levels of T3/T4 are low, the hypothalamus secretes TRH (Thyrotropin Releasing Hormone), which causes the pituitary gland to secrete TSH (Thyroid Stimulating Hormone or Thyrotropin), which stimulates the thyroid gland to secrete T3 and T4. It used to be thought that laminitic ponies suffered from low thyroid hormone concentrations, but there is no evidence that thryoid problems cause EMS/IR or PPID. Thyroid hormones vary considerably in horses with EMS, but this is not the cause of their obesity. Some drugs, e.g. Bute (phenylbutazone), glucocorticoid steroids and trrimethoprim-sulfonamide antibiotics can decrease thyroid hormone concentrations, therefore thyroid testing should not be carried out while such drugs are being administered. "Phenylbutazone given at a dosage of 4.4 mg/kg every 24 hours, for 7 days did significantly decrease resting T4 and fT4 concentrations, but did not significantly affect T3 concentrations in horses." The Equine Manual - Higgins & Snyder 2013 p 652 Phenylbutazone is highly protein bound and can displace thyroid hormone from carrier proteins, leading to increased amounts of free thyroid hormone and consequent inhibition of the hypothalamus-pituitary-thyroid axis. Iodine is necessary for the synthesis of T3 and T4, thyroid hormones that regulate metabolism. An increase in T3 or T4 leads to reduced TSH secretion and an increase in metabolic rate. Both iodine excess and deficiency reduce the production of thyroid hormones, causing hypothyroidism and an increase in TSH production, leading to goiter (an increase in the size of the thyroid glands). Symptoms: as well as goiter, excess iodine can cause abortion, foal mortality, hair loss. Iodine deficiency can cause foal abnormalities. Urinary iodine content can give an indication of the amount of iodine being fed. Iodine and selenium interact - high levels of iodine in the diet combined with low levels of selenium may cause thyroid tissue damage. The iodine content of most horse feeds ranges from 0 to 2 mg/kg DM, depending on the iodine content of the soil. Toxicity is usually the result of oversupplementation or eating feeds with high levels of iodine, e.g. kelp and seaweed, which can have iodine levels over 1,800 mg/kg DM. Goitrogens can affect iodine uptake and are found in soya beans, linseed and brassicas (cabbage, kale, broccoli, cauliflower, swede, turnip). Maximum tolerable concentration 5 mg/kg diet, although iodine toxicity has been reported at 40 mg/day. Minimum recommendation 0.007 mg/kg BW or 3.5 mg/day for a 500 kg horse. For horses with EMS/insulin resistance, drugs should never be used as a substitute for diet, exercise and management changes.. However, Thyro-L (Levothyroxine sodium) has been used at higher doses for 3 - 6 months to stimulate metabolism and induce weight loss in obese horses that are not losing weight. Levothyroxine sodium can induce weight loss and improve insulin sensitivity. Dose: horses and larger ponies (>350 kg) 48 mg/day, smaller ponies and miniatures 24 mg/day. Given in the feed for 3 - 6 months at the same time as diet and exercise changes are implemented. It is very important to wean horses slowly off of Levothyroxine sodium by reducing the dose to half for 2 weeks and then half again for a further 2 weeks (so if full dose was 48 mg/day, reduce the dose to 24 mg/day for 2 weeks, then to 12 mg/day for 2 weeks, then stop). Obesity is a risk factor for the development of insulin resistance. Adipose tissue secretes adipokines that may influence insulin sensitivity. TNF-alpha is overexpressed in adipose tissue of obese animals and humans and has been proposed as a link between obesity and insulin resistance. Ingested food enters the stomach and passes into the lumen of the small intestine. Sugars and starch are digested if necessary (broken down by enzymes to monosaccharides: glucose, fructose, galactose) and transported through the gut wall into enterocyte cells, then into the portal vein, which carries them to the liver. The first membrane sugars have to cross - the membrane between the gut lumen (along which the ingested food passes) and the enterocyte cells - is called the apical membrane or brush border membrane. Glucose and galactose are actively transported across this border by Sodium Glucose Transporter 1(SGLT-1) (this requires energy - ATP). When the concentration of carbohydrates in the lumen is high, glucose, galactose and fructose can also be transported (facilitated transport) across the apical membrane by GLUT-2. Glucose Transporter 5 (GLUT-5) transports fructose (facilitated transport). The second membrane sugars have to cross - the membrane between the enterocyte cells and the portal blood circulation - is called the basolateral membrane. Glucose, galactose and fructose leave the enterocyte facilitated by GLUT-2 transporters. Advanced Nutrition and Human Metabolism - Gropper & Smith, 2013 p 72 good illustration of the transport of monosaccharides into enterocytes. Slide 7 - good graphic of sugar transportation across the gut wall. Shirazi-Beechey, S.P., Moran, A.W., et al. "Horses possess the ability to upregulate SGLT1 expression in response to increased dietary carbohydrates, and to enhance the capacity of the gut to absorb glucose." "Glucose transport rates, SGLT1 protein, and mRNA expression were all 2-fold higher in the jejunum and 3- to 5-fold higher in the ileum of horses maintained on a hydrolyzable carbohydrate-enriched diet compared to pasture forage." SGLT-1 expression increased in the duodenum and ileum as the carbohydrate content of the diet increased slowly from <1 g/kg bw to 6 g/kg bw. TRH stimulates the horse's pituitary gland to release POMC-derived peptides, including alpha-MSH from the pars intermedia and ACTH from the pars distalis - this may be caused by TRH's ability to decrease dopamine secretion. TRH also stimulates the secretion of prolactin and growth hormone from the pars distalis. TRH release is suppressed by TSH, thyroid hormones and glucocorticoids. TRH receptor RNA is expressed in both the pars distalis and pars intermedia of the horse. What is the TRH stimulation test? - TRH stimulation of ACTH - used as the initial test for early PPID cases or when basal ACTH has given an equivocal result, or a negative result when PPID is suspected. TRH stimulates pars intermedia activity, and the TRH stimulation of ACTH test relies upon horses with PPID producing higher amounts of ACTH than normal horses following an injection of thryotropin releasing hormone. However, in her 2014 webinar Is it PPID or is it EMS – Diagnosing Equine Endocrine Disease (see also Is it PPID or is it EMS? ), Dianne McFarlane suggested that increased activity does not necessarily mean dysfunction - increased activity could be appropriate and not due to lack of dopaminergic inhibition. 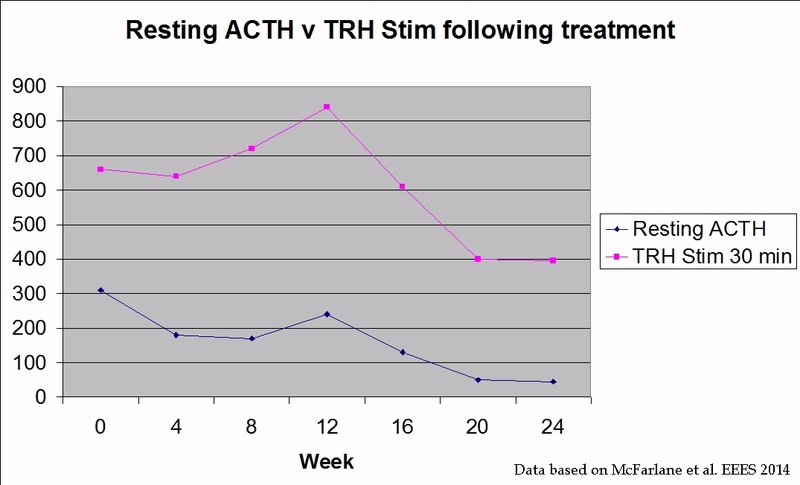 The TRH stimulation of ACTH is a relatively new test, and research into the interpretation of results is ongoing. In 2014 the sensitivity (true positives) and specificity (true negatives) were considered to be 88-95% and 71-91% respectively for the TRH stimulation of ACTH, suggesting that this test is more accurate than basal ACTH. The TRH stimulation of cortisol is not considered to be diagnostic of PPID and should not be used (cortisol increases in both normal and PPID horses in response to TRH). (* NB The Laminitis Site suggests that testing two or more of the hormones produced in excess (alpha-MSH, beta-endorphin, CLIP, ACTH) might improve diagnostic accuracy of PPID, and profiling hormone levels against clinical signs might help to increase our understanding of PPID). The TRH stimulation test can be carried out at any time of day. Although reference ranges have recently been suggested for the seasonal rise (Adams et al p 12 Equine Endocrinology Summit 2017), other researchers have not experienced similar results, so for the moment (January 2018) the TRH stimulation test should not be carried out between mid-July and mid-November. See the Equine Endocrinology Group for updates. Horses can be fed hay in the hours before the test but cereal feeds should not be fed within 12 hours of the test. Do not carry out a TRH stimulation test within 24 hours of an oral sugar test (Restifo et al. 2016). Collect a basal ACTH sample into EDTA (time 0). Inject 1.0 mg of TRH** (for horses >250 kg. For ponies <250 kg use 0.5 mg TRH) intravenously. Collect a second ACTH sample into EDTA exactly 10 minutes after TRH administration (time 10). Use glass or plastic EDTA tubes. Chill samples within 3 hours and ideally immediately. Separate the plasma ideally by centrifugation. If plasma is separated by gravity, it must never be frozen - gravity-separated samples may give falsely high results. Keep chilled during transport to the testing laboratory (freezing is not necessary but may be desirable if samples may not reach the laboratory within 48 hours - but note samples must be separated by centrifugation before freezing). Note TRH administration may cause transient side effects of coughing, yawning, trembling, lip smacking and Flehmen response, but no serious adverse effects have been reported. ** Pharmaceutical grade TRH is not available in the UK, but chemical grade TRH can be used and can be purchased from Phoenix Pharmaceuticals Inc: Thyrotropin-Releasing Hormone product 062-10, or can often be bought from the testing laboratories (e.g. Rossdales Laboratories, Liphook Equine Hospital). See ACTH TRH Stimulation Test Information Sheet - Liphook Equine Hospital and Laboratory. NB Breed may affect response. ​In her 2014 webinar, Dianne McFarlane suggested that PPID is progressive and difficult to diagnose in the early stages, therefore there will be a grey zone for testing in the early stages of the disease. Diagnosis should be based on history and clinical signs as well as diagnostic test results. 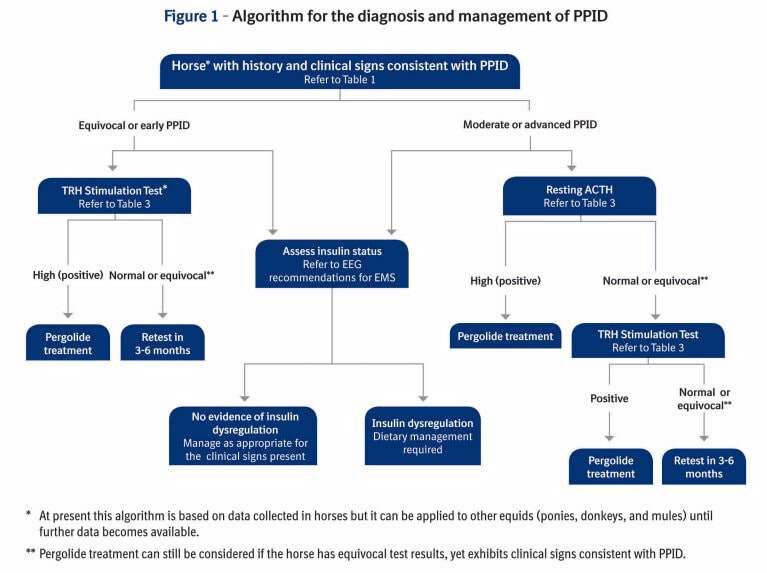 Horses with clinical signs of PPID but negative test results should be retested and/or have treatment instigated. Feeding or fasting beforehand made no difference to TRH stimulation of ACTH results. TRH stimulation of ACTH results were significantly lower when carried out 60 minutes after an oral sugar test. Current recommendations (2017) are that an oral sugar test and TRH stimulation of ACTH should not be carried out at the same time. "Adverse effects associated with TRH administration included transient coughing and yawning." "Results indicated that the TRH stimulation test should not be repeated within 24 hours, and cTRH solution stored at room temperature could be used to effectively perform TRH stimulation testing in horses." "Measuring ACTH concentration after TRH administration appears superior to measuring cortisol concentration as a diagnostic test for PPID." "Results suggested that ACTH concentration in response to TRH administration was useful for the diagnosis of PPID in horses and appeared more accurate than response to domperidone administration. Use of an α-MSH concentration ≥ 30 or 50 pmol/L did not appear superior to use of an ACTH concentration ≥ 36 pg/mL for the diagnosis of PPID, either before or 30 minutes after TRH administration." "The ACTH response to TRH is a useful test for diagnosis of pituitary gland hyperplasia, particularly in horses in which baseline ACTH concentrations are within reference range." Domest Anim Endocrinol. 2006 May;30(4):276-88. Epub 2005 Aug 9. Alpha-melanocyte stimulating hormone release in response to thyrotropin releasing hormone in healthy horses, horses with pituitary pars intermedia dysfunction and equine pars intermedia explants. "We proposed that TRH directly stimulates the PI in normal and PPID-affected horses to release proopiomelanocortin (POMC) derived peptides. Using alpha-melanocyte stimulating hormone (alpha-MSH) as a marker of a PI response and ACTH as a marker of a PD response, we were able to demonstrate a marked increase in plasma concentration of alpha-MSH and a modest, but significant increase in ACTH after TRH treatment in normal horses. The ability of TRH to directly stimulate release of POMC peptides was confirmed using PI and PD tissue explants.... We conclude that TRH triggers the release of POMC-derived peptides from the PI through the direct stimulation of TRH receptors normally expressed on melanotropes." ​Can the TRH stimulation test be used for monitoring response to treatment? "The test used to diagnose PPID (e.g., plasma ACTH concentration or TRH stimulation test) should be rechecked after 30 days to assess the response to treatment. A period of two months is required before conclusions should be drawn about changes in clinical signs." "It may be possible to reduce the dosage of pergolide when switching from compounded pergolide to Prascend. First consider the current status of the horse. If PPID is well controlled, consider a lower dosage of Prascend (maximum recommended reduction of 50%). Response to treatment is assessed by measuring ACTH concentration after 30 days and considering history and physical examination findings". However, presenting at the 2nd European Equine Endocrinology Symposium in May 2014, Dr McFarlane (one of the researchers responsible for the EEG Recommendations) reported that when horses with PPID were treated with pergolide and retested using both resting ACTH and the TRH stimulation of ACTH every 4 weeks, resting ACTH levels dropped significantly after starting treatment, but TRH stimulation of ACTH results didn't drop until 20 weeks after treatment was started - in fact TRH stimulated ACTH rose significantly following the start of treatment with pergolide. Dr McFarlane concluded that "further work should be performed to determine if provocative testing is necessary to adequately assess response to treatment". As at 2016, Liphook Equine Hospital is suggesting testing adiponectin for assessing obesity and possible laminitis risk, and does not suggest testing triglycerides as part of a laminitis risk panel. See Endocrinopathic Laminitis 2016. Trilostane is a competitive inhibitor of the enzyme 3-beta hydroxysteroid dehydrogenase, and works by inhibiting corticosteroid synthesis in the adrenal glands, i.e. it inhibits the production of cortisol. It is commonly used for dogs with pituitary dependent hyperadrenocorticism. Whilst pergolide is the treatment of choice for PPID, it may be that horses with PPID that develop adrenal hyperplasia (reported to be around 20% - these are likely to be advanced cases of PPID) could benefit from treatment with trilostane. McGowan and Neiger (2003) used an average dose of 0.5 mg/kg bodyweight trilostane. Nicholas Frank suggested that the recommended dosage for trilostane should now be 1.0 mg/kg once a day, given in the evening.